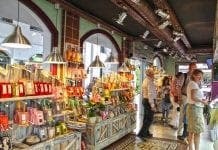 AN interactive projection, a secret passageway and a doorway for ‘oompa lumpers’ are just three of the exciting innovations being installed in a new chocolate factory in Mijas. Part of the wild and wonderful imagination of its expat owners Jason Godwin and Eli McCarthy, it is set to be one of the most exciting new museums to open on the coast this year. Making Willy Wonka proud, the factory will offer excited children (and adults) a tour into the history of chocolate making and the opportunity to make their very own bars. Set next to a series of ceramics and trinkets shops in Plaza Virgen de la Pena, it is being created for a small fortune and runs deep into the ground. 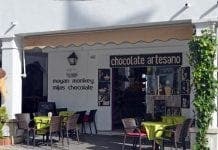 The couple already have two chocolate factories in the town – the current one the Mayan Monkey in Plaza de la Constitucion always buzzing with punters – but when a prime site cropped up nearer the town hall, they couldn’t resist the opportunity. Combining a factory, a museum, a cafe and a shop, Jason describes the new venture as a ‘happiness laboratory’. “Eli and I decided we wanted to do something fun, something that the tourists can really feel warm and fuzzy about,” said Jason. Jason’s description of the factory gives the impression of a real Roald Dahl creation, complete with secret doors, chocolate-lined corridors, and glass walls revealing ingenious chocolate-making machinery. Godwin has been on the Costa del Sol for 22 years and is full of admiration for the pueblo that houses his chocolate empire. As a cultural heritage site, the town hall has to scrutinise all planning applications to ensure everything fits with the traditional aesthetic. However, in a bid to support tourism and boost the local economy, the town encourages new businesses and entrepreneurship. “They are really up for backing small businesses and looking to help businesses that will employ people,” said Jason. Mayan Money not only make all their own chocolate, using locally sourced ingredients, they also offer chocolate-making workshops which include an introduction to the chocolatier craft. But Jason and Eli insist they never want to take their business too seriously. “We don’t want to be snobby about it, and we didn’t want to try to pass ourselves off as experts,” said Jason.